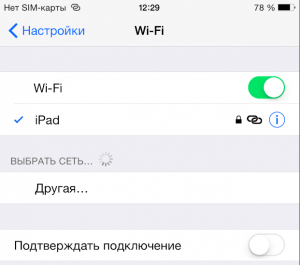 How to create a WiFi-network on the iPhone? Today, in almost any restaurant, cafe or entertainment center, you can connect to the Internet for free via the wifi access point. However, sometimes there are situations when for some reason there is no access to the network in a public place. If you have a laptop or a smartphone from Apple, you can work around this problem. This phone can connect to the Internet using 3G or LTE standards. To activate the ability to distribute via wifi on the Apple smartphone, you must first enter the settings and enable “3G”, “Cellular data” and “4G / LTE” if such a standard is supported by the phone model. This format will give the opportunity to transfer data much faster. After that, select the menu item "Modem Mode" and activate this setting. Now the iPhone smartphone will be able to distribute internet via wifi. This is achieved due to the ability of the phone to work in the modem mode for wireless communication. If there is no such item as “Modem Mode” in the settings menu of your smartphone, then you need to enter the “Cellular Communication” section. Here you can see all the settings that are used by phones to use the mobile Internet. Similar information is also available on the official page of each mobile operator whose SIM card is installed in the device. Here, the owner of the smartphone will see three lines, namely: “APN”, “Username” and “Password”. Further below is the item "Modem Mode". You must select this part of the menu and copy the information from the “APN”, “Username” and “Password” lines here. 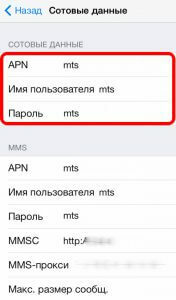 After entering this information, the inscription “Modem Mode” should also appear under the “Cellular Communication” line in the previous phone settings section. By default, this option is in the disabled position. The user needs to move the slider and thereby enable modem mode. It will be incidentally to say that under the line for switching on the mode of operation of the phone as a modem, you can see a brief instruction on how to set up the distribution of mobile Internet via wifi. In addition, in this part of the settings, you can set a password for connecting other devices to the wifi network. To do this, select the “Wi-Fi password” line and in the opened window, enter a combination of eight characters using the graphic keyboard. Upon completion of these simple manipulations, the iPhone smartphone will switch to the mode of operation as a modem and will be able to provide Internet access to other devices connected via wifi to this unit. To join the established network to a user of another phone, tablet or computer, you will need to select the required connection in the settings and enter the password set by the iPhone owner. If the new network was created as expected and other devices will be able to connect to the Internet via iPhone, then in the upper corner of the phone screen, next to information about the charge level of the device, time and connection to the Internet, a flickering alert will appear: "Modem mode - 1 connections" Here, the number one indicates the number of devices that use the Internet distributor iPhone. It will be by the way to emphasize that the ability to create a public network and distribute the Internet is not only the latest model of the Apple iPhone 6, but also earlier versions of these devices. The main condition for this is the presence in the device of the operating system, starting from iOS 5. At the same time, it should be noted that the battery of the smartphone distributing via wifi internet is discharged the faster, the more time it works in the modem mode. At the same time, the number of connected receivers also affects the rate of decrease in battery charge. 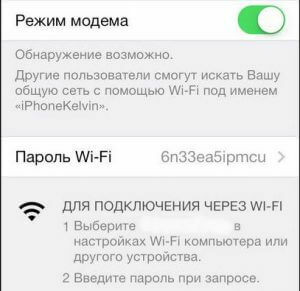 Appsgames⟾IOS tutorials⟾How to create a WiFi-network on the iPhone?